Get the No.1 Windows 8.1 DVD Ripper to rip DVD on Windows 8.1/10 OS at the fastest speed without the help of other codecs like HandBrake! Microsoft introduced and released Windows 8.1 with new manageability, mobility, security, user experience and networking capabilities for modern businesses use, for example, on UI experience, Workplace Join, Work Folders, Open MDM, Mobile Device Management, Web Application Proxy, NFC Tap-to-pair Printing, VPN, Auto-triggered VPN, Mobile Broadband, Windows To Go, Remote Business Data Removal, Malware Resistance, etc. It means that we can watch DVD movies and videos on Windows 8.1 tablets and PCs more safely, conveniently and portably. Is It Necessary to Upgrade Windows 8 to Windows 8.1? Microsoft added 0.1 to Windows 8, which doesn't mean Windows 8.1 is rebranded based on Windows 8 rebrand. However, Windows 8.1 advances Windows 8 and Windows 7 in many ways, so, if conditions permit, there is no reason why it should not to update Windows 8 to Windows 8.1 and the furthcoming Windows 10. Compared with HandBrake, WinX DVD Ripper is a free DVD ripping software for Windows 8.1 that is more stand-alone, easy to use and powerful. It does not needs third-party software like VLC to help remove copy-protection from commercial DVDs and does not require complicated parameter settings. 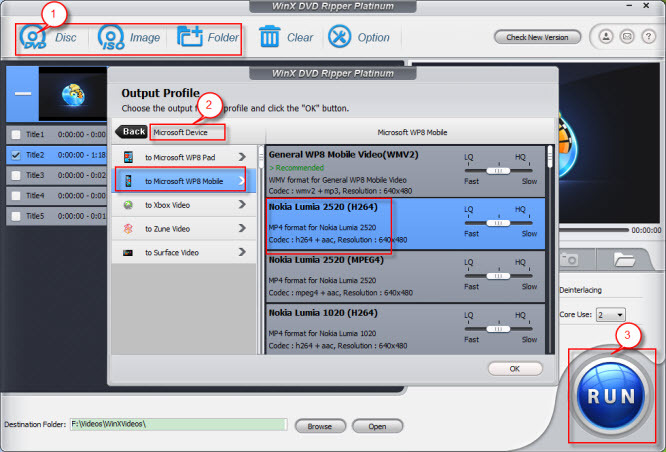 For more differences between the two free DVD rippers, please read WinX DVD Ripper vs HandBrake. WinX DVD Ripper Platinum is the advanced HandBrake Alternative that is well compatible with Windows 10, Windows 8.1, Windows 8, Windows 7, Windows XP and other Windows OS. It can rip any DVDs on Windows 8.1 as well as convert DVDs for Windows Phone 8.1, Windows 8.1 tablets, Surface RT, DVD to iOS and Android devices and so on. This fast Windows 8.1 DVD ripper can rip DVD/ISO image files to AVI, MP4, H.264, MPEG, WMV, MOV, FLV, M2TS, iPhone X/8/7/6/S/6 Plus, iPad Air 2/mini 3, iPod/6, Apple TV/4, iTunes, Android Google New Nexus 7, Samsung Galaxy S9, Note Edge, 10.1, HTC One, Kindle Fire HDX, Microsoft (WP8, Surface Pro 3, Xbox One), Sony PSP, and so on. It can also clone and copy DVD to ISO image file, MPEG2 and DVD folder without quality loss while bypassing DVD CSS, region code, RCE, Sony ArccOS, UOPs, Disney X-project DRM, etc. Windows 10 vs Widnows 8: It shows you all the new features and improvements of Windows 10.